In our ever-changing world, baby boomers are a unique generation. Generally, they grew up healthier and wealthier than their parents and with a strong belief in an improving world. As baby boomers have grown older, they have tended to face the changes in their health and bodies with an open and optimistic attitude. The rock and roll generation’s fun-loving and active lifestyles set the tone for those that follow. And so it comes as a surprise that the same is not true of baby boomers with hearing loss. A recent study found that 38 million baby boomers in the United States experience various degrees of hearing difficulties. Why are boomers so timid about getting their hearing fixed? Improved hearing may ward of dementia and Alzheimer's, means better relationships, more income, and has been shown to relieve depression and feelings of isolation, so why are boomers neglecting their ears? Quite simply, it’s a matter of old stereotypes. Literally. Boomers don’t mind doing what they can to stay young and active, but they don’t like the idea of facing a condition that to them seems to indicate they are old. Changes in hearing, unlike eyesight, has strong stereotypes attached to it that devalue hearing health. Past stereotypes of people with hearing loss and those who wear hearing aids as being old and out of touch means hip baby boomers shy, almost spasmodically, away from dealing with their hearing loss. The irony is that the stereotypes are not true. People who deal with their hearing loss are shown to feel and act younger and are seen as more in touch. They have less problem understanding conversations, are more relaxed in social settings, and because today’s hearing aids are so small, they are rarely spotted. 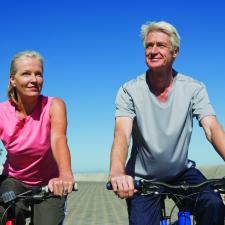 Myths about hearing aids keep boomers from facing their fears. It is much more conspicuous to people when someone with hearing loss is denying their issue than wearing a hearing aid. Many times someone with hearing loss nods or smiles or pretends to understand in the hopes that they will fool people, but this is never the case. The only person they are fooling is themselves. So come on, baby boomers, you’ve led the way before. You’ve championed change and have shown your kids how to live more active and adventurous lifestyles as they age, so it's time to step up. See your audiologist and get back into the hearing world!